I could feel my neck being yanked backwards as I tried to free my ponytail from between two tightly squeezed arms. I looked at my friend Cami Mavelian, a freshman from Dallas, Texas, struggling for breath as the crowd pushed us forward. “Nadia. … Nadia. I can’t breathe.” I could tell from her gasps that she, indeed, was struggling to breathe in the crush of people. Still, we smiled and waited patiently. Three hours later, as the gates opened to reach the Washington Mall, Cami and I linked arms, determined not to lose one another. We were weak and tired, our faces pale, until a nice, large man was kind enough to make way for us to push past the crowd, through security, and into the open. We had made it to President Barack Obama’s second inauguration! Sort of. My ponytail was my own again, and Cami’s breathing was regular. Cami, now charged with energy and determination, grabbed my hand as we ran toward the Mall to see finally—on a giant screen—President Obama inaugurated for his second term. Cami and I, along with five other Austin College students, attended the inauguration during a January Term course on the U.S. Supreme Court that included two weeks in Washington, D.C.
Before students left for Washington, D.C., they received a “primer on the Court and constitutional law” from Kenneth Street, Austin College professor emeritus of political science and introductory information from others in the legal profession. Once in D.C., students met with Supreme Court Justice Clarence Thomas, attended oral arguments on six cases before the Supreme Court, and met with several lawyers, law professors, and high-profile media professionals who cover the Supreme Court. The class traveled to Gettysburg National Military Park, which McCarthy said was “my effort to show in real terms what happens when opposing sides in this country can’t do what Americans do best, compromise.” Following the inauguration, the group traveled to Austin, Texas, for a tour of the Supreme Court of Texas and a meeting with its Chief Justice Wallace B. Jefferson, as well as a visit to the University of Texas School of Law. 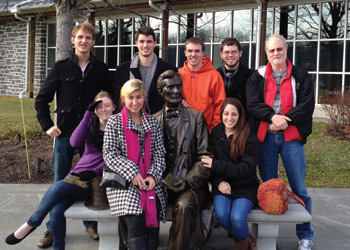 “This Jan Term was one of the best experiences I have had at Austin College,” said Will Reynolds ’14. “I took this course because I wanted to gain a better understanding of the institution that has had such a monumental influence on our country’s history. Getting to meet so many amazing people and sit down and discuss politics was such an engaging experience, especially considering we were able to speak with people from both sides of the political spectrum. One of the experiences that stood out to me the most was our meeting with Justice Thomas. Having gone in which the expectation of a 30-minute session in a formal setting, being invited back to his office and spending a full hour and a half talking was a memory that will stay with me for a long time to come.” Will plans to teach history and found the trip to Gettysburg particularly special, and expects to integrate everything he learned in D.C. into his classroom one day. Students James Taylor ’14 and Robert Reilley ’14 took the course because of the interest in law, but found added meaning in other aspects of the trip. Robert, who plans to attend law school, considered it “one of the most intellectually stimulating months” he’s had. All the students agreed it was an eye-opening and rare opportunity. But back on the Mall, on that bitterly cold January 21 morning, my friend Cami unable to breathe, was my favorite part of the trip. Even though we seemed near to death several times trying to squeeze our way into the crowd, the inauguration was worth spending eight freezing hours to see, next to thousands of strangers constantly commenting and opining—even watching on a stadium-sized screen when we could have seen more on television in our warm hotel room—that will be my treasured memory of Jan Term 2013.